I (Ron) grew up skiing Santa Fe, which is the closest decent ski area to the population centers of Santa Fe and Albuquerque. The day AiRung skied at Santa Fe it was blowing about 50 mph at the top and was about 10-degrees F. That was bad luck because Santa Fe is a great ski area when it’s not blowing and cold. 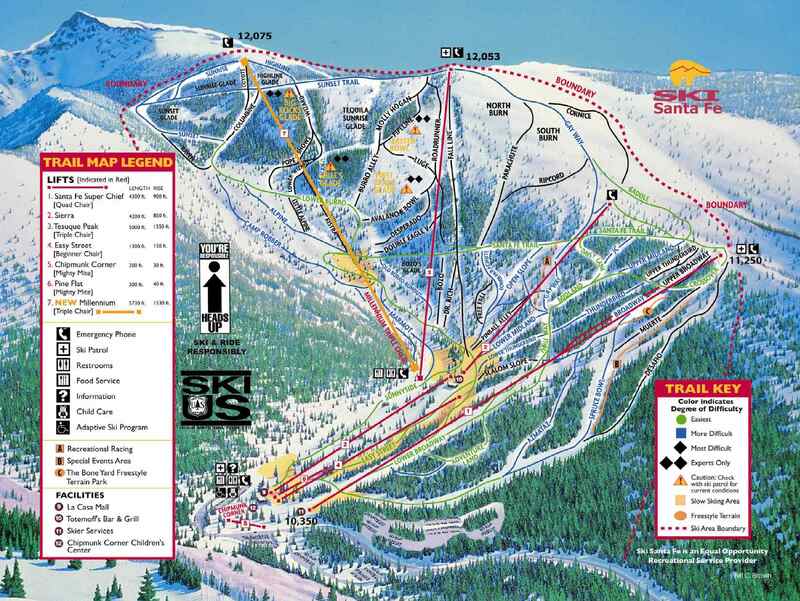 I have skied Santa Fe more than 20 times. In New Mexico it is second only to Taos, but is a much shorter drive from Albuquerque than Taos is. 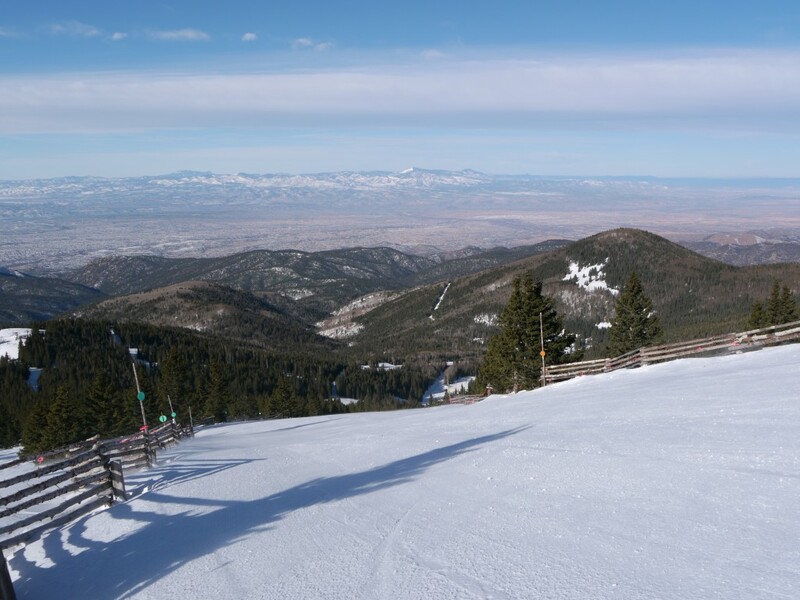 The town of Santa Fe is right at the bottom of the access road which provides great apre-ski opportunities in the Old Town area. The mountain is very high, with a base of about 10,400 ft and a summit of over 12,000 ft. That makes it cold and windy a lot of the time, but also provides for some great dry snow. The views from the top are spectacular. There are 3 ski pods all on the west side of the peak. The lower right is serviced by a “low speed” quad with some nice blues on the left and some short bump runs. This is the only area that has snowmaking, so early season it’s often the only chair open. The real action is found on the upper 2 triple chairs, which fan out right and left from the same spot which is only a couple hundred feet higher than the base lodge. The chair on the right used to be the only lift to the top, which was originally a high-speed detachable platter pull. It was fun watching people get launched by that thing back in the 80’s and early 90’s before the chair was put in. It made for a tiring day riding the platter at high speed up the 1400 vertical and then skiing back down the difficult runs to skiers right like Tequila Sunrise or or Burro Alley. In the 90’s they installed the new triple chair and the upper mountain became somewhat more civilized. A few years ago they installed another longer triple that provides a more direct route to one of only 2 blue runs from the top of the mountain so skiers don’t have to ski a long road. Santa Fe does some nice grooming. Parachute is a long black groomer that takes you right down the fall-line from the top. Sunrise is a fun blue groomer with some interesting twists and turns. The real fun is found on the ungroomed black runs on upper mountain. 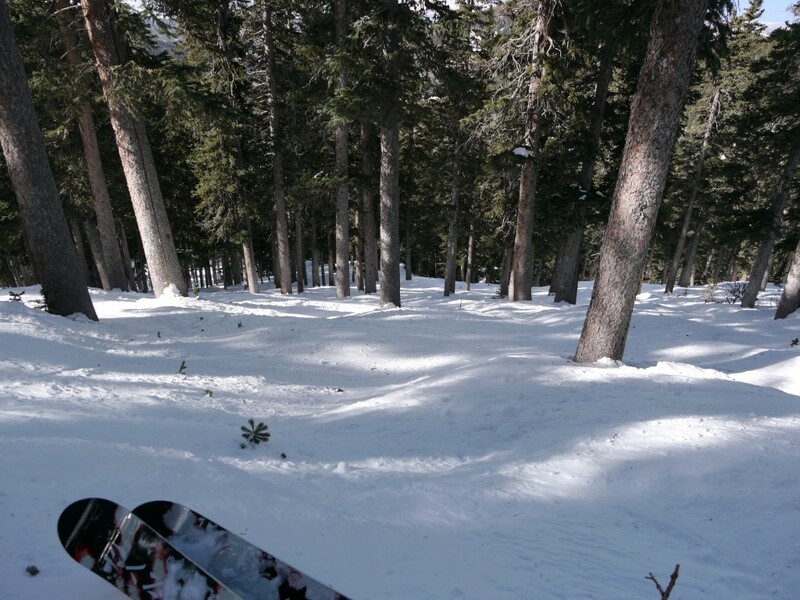 Tequila Sunrise is one of our favorite tree runs ever. Burro Alley and Wizard are really interesting long bump runs. There are some seriously steep double-black runs like Double Eagle. Santa Fe really has everything you need for a fun day of skiing in a nice compact layout. The snow is usually the 2nd best in the state and it is pretty reliable. The variety of runs including steeps, trees, groomers, and easy greens should keep everyone happy for a couple of days. The views from the top are fantastic. Being close to the old town of Santa Fe is great for lodging, apre-ski, or just walking around. It’s usually not that crowded, and the place has a friendly vibe. The access road from the town is 16 miles of curvy road. When I first started skiing there in 1978 it was a dirt road, but it was paved a long time ago so it is better now. The wind can be really bad at the top of the mountain, and the high altitude means it’s colder than lower areas like Sandia Peak. They could definitely use more snowmaking for years with low snowfall. Although the weather was bad when we were there together, the snow was great. We quit early though and had a great late lunch down at the Hotel La Fonda in the old town of Santa Fe. Yes! Santa Fe is a somewhat hidden gem, and if we are in New Mexico we will definitely go back. The town is a great destination itself, and when combined with the skiing it’s a great place to visit.